Arnold Abbott is led away by police. (PHOTO: Youtube screenshot). 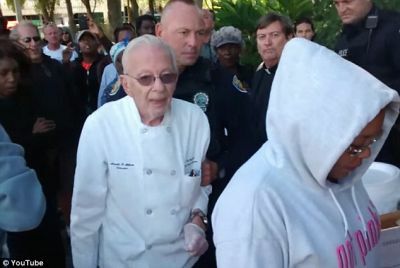 Arnold Abbott, the 90-year-old man who was arrested for feeding the homeless in Fort Lauderdale was re-arrested 24 hours later for the same offense. Abbott and two pastors were all arrested on Tuesday for violating a new law that went into effect last week, preventing people from feeding the homeless. All three men face fines of $500 and up to 60 days in jail for their charitable work. And while Abbott has received a lot of support from people around the world, Fort Lauderdale Mayor Jack Seiler is not a fan. “Mr. Abbott has decided that he doesn’t think these individuals should have to have any interaction with government, [but] that they should be fed in the parks. We disagree,” Seiler said. Seiler fully supports the ordinance and says that it is meant to protect the homeless, not punish them in any way or form. Abbott and the pastors had been feeding the homeless for quite some time before the new law went into effect and their arrest. Abbott’s story went viral, making him an instant celebrity and garnering fans and support; he has said that he intends to sue the city again to have the law overturned. He sued Fort Lauderdale in 1991 after he was banned from feeding the homeless on the beach. He won that lawsuit. Abbot has said that he will continue doing whatever is necessary to keep feeding those who need it most. Advocates for the homeless have planned a week of protests and marches to bring awareness to the plight of the people from Oct. 31 to Nov. 7, with an online hashtag of #resisthomelesshatelaws. There is something so crazy, evil and bizarre about making it illegal to feed hungry people.